Equity strategy serves as the ultimate shock absorber, helping companies balance the two core tensions of growth and succession – specifically the scarcities of cash, talent, and confidence for succession. Thus, capital structure is the second core element of the BOLD Value Value Architecture.Through our BOLD Value approach, our team help clients refresh their capital structures for each stage of growth. *These are hypothetical numbers. Individual company's revenue growth may vary. Support for leadership succession, capital succession,and business succession. 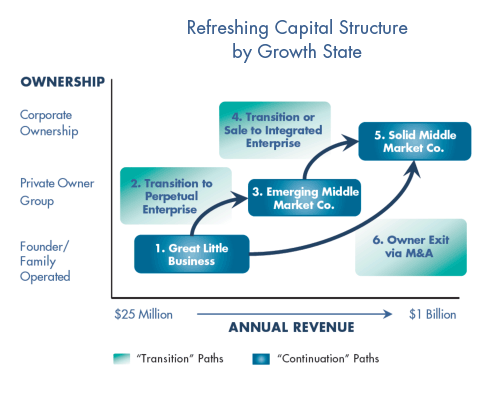 The ultimate goal of our work on capital structure: strengthen the resiliency of the business so it can thrive across the myriad stages of growth and succession.